Funeral service for George H. “Dave” Davidson IV, 46, of Nacogdoches, Texas, will be 2 p.m. Sunday, October 19, 2003, at Christ Episcopal Church with the Rev. Gary Hill and the Rev. Terry Hodge officiating. Burial will be in Sunset Memorial Park. 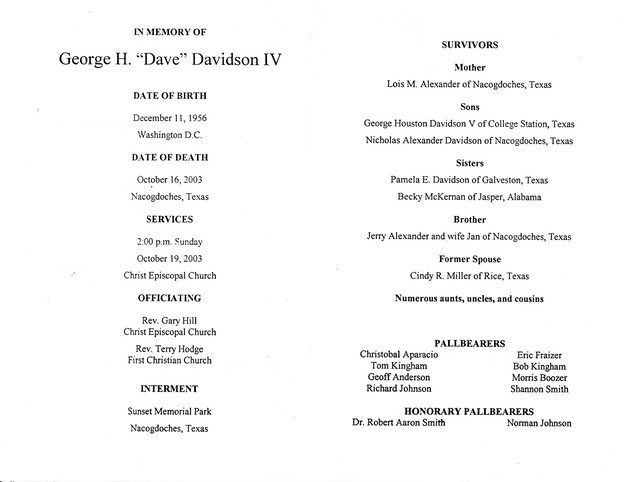 George H. “Dave” Davidson IV passed away on October 16, 2003, in Nacogdoches, Texas. 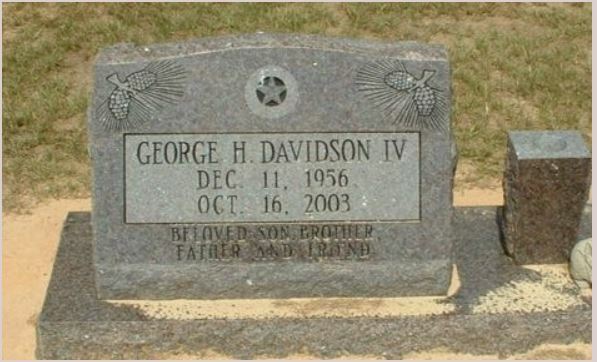 He is preceded in death by his father, George H. Davidson III. Born December 11, 1956, in Washington D.C., he was the son of George H. Davidson III and Lois M. Alexander. George was a member of Christ Episcopal Church and a graduate of Texas A&M State University. He is survived by his mother, Lois M. Alexander of Nacogdoches, Texas; sons, George Houston Davidson V of College Station, Texas, and Nicholas Alexander Davidson of Nacogdoches, Texas; sisters, Pamela E. Davidson of Galveston, Texas and Becky McKernan of Jasper, Alabama; brother, Jerry Alexander and wife, Jan, of Nacogdoches, Texas; former spouse, Cindy R. Miller of Rice, Texas; and numerous aunts, uncles and cousins. Serving as pallbearers will be Christobal Aparacio, Eric Frazier, Tom Kingham, Bob Kingham, Geoff Anderson, Morris Boozer, Richard Johnson and Shannon Smith. Honorary pallbearers will be Dr. Robert A. Smith and Norman Johnson. Memorial donations may be made to First Christian Church Building Fund, 702 N. Mound St., Nacogdoches, Texas 75961. Visitation will be from 4 until 6 p.m. today at the funeral home. Dave always seemed so shy and nice. Fond memories remembering our dates our Junior year.